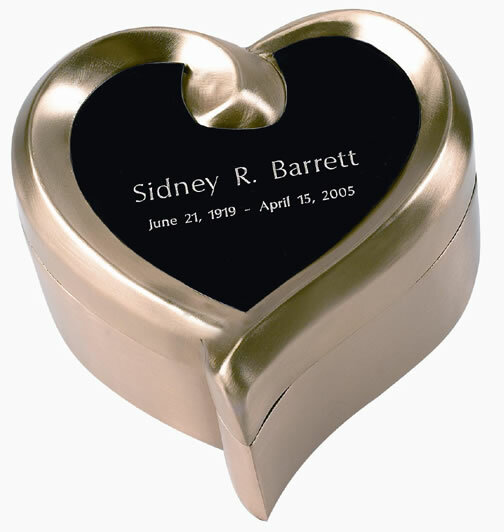 The Brushed Brass Cremation Keepsake Urn Set includes a tiny brass urn with a brushed finish and a brushed brass heart-shaped case. This tiny urn holds a few tablespoons of cremains, sacred ground, crushed dried flowers, or other small memento. The velvet-lined, heart-shaped case has room for two short lines of engraving on the lid. The keepsake urn is top loading with secure threaded lid. Felt base. Please limit engraving to no more than about 20 spaces for the name and about 26 spaces for the dates or a short sentiment. The engraving is on a black heart-shaped name plate that fits into the indented area on the top of the lid. Usually ships same business day if ordered by noon EST. Ships from the East Coast.